The leek moth (LM) is a recent invasive pest occurring within Northern NY and Vermont. A pest of onions and garlic, LM is a serious threat to diversified farms in the region. Recent ecological simulations predict that “the continued range expansion of LM…appears to be inevitable”. Our monitoring program will monitor the LM’s known and potential distribution. The objective of the monitoring program will be to describe the current distribution of the pest and to assess its local phenology. Owing to the favorable growing conditions within the Northeast for alliums, garlic and onion crops constitute a valuable portion of the fresh vegetable market, and therefore, represents a high risk area for LM (1). Furthermore, the potential distribution of the pest extends throughout the entire eastern half of the US (2). Three basic stages typify an invasion: introduction, establishment, and expansion (3). Depending upon the stage of an invasion, response strategies will differ in scope and scale. According to recent surveys, the LM is in the establishment phase in VT and may already be found in adjacent regions. Monitoring and control programs developed early during the LM invasion will provide farmers outside the establishment zone with an effective framework for rapid response. Our project will have a significant impact on the allium crop industry as reports of up to 80% loss have been reported for growers in the region. Diversified vegetable farmers in the northeastern USA are the primary beneficiaries. However, other beneficiaries will be regional extension agents and gardeners. During recent LM workshops, we communicated the threat of the LM to growers, extension agents and local ecologists. 66% of workshop attendees responding to surveys indicated the presence of leek moth damage or interest in the distribution data and/or monitoring strategies to reduce the impact of the moth. In addition, growers outside the region have shown particular concern over the rate of expansion and the likelihood of the moth reaching their farms in the immediate future. The monitoring program will include an extensive regional sampling effort throughout the leek moth’s known and nearby potential distribution. The intent of the monitoring program will be to better describe the current distribution of the pest and to assess its seasonal phenology. The phenological data acquired from the monitoring program will provide important information for the effective deployment of control tactics being tested in field trials. The proposed monitoring project plays a pivotal role in a larger Integrated Pest Management (IPM) study for the leek moth. Monitoring is essential for informing farmers and pest management professionals on the phenology and regional distribution of the insect. Without knowing where and when the pest will arrive in the region, landscape and field, many pest management tactics are rendered useless. We are currently studying and applying for funding via multiple outlets to achieve the following objectives: 1.Describe the current distribution of the moth and develop emergence and flight models. (THIS PROPOSED PROJECT) 2.Expand the available IPM toolbox for growers. Management trials will involve the testing of IPM strategies including cultural and physical controls. 3. Increase the adoption of best management practices for LM control by allium growers via an outreach program that will use participatory action methods to share techniques via farmer-to-farmer networks. 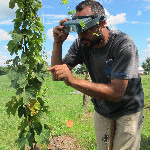 Victor Izzo, Ph.D., is an insect ecologist, research associate and instructor in the Plant and Soil Science Department (PSS) at the University of Vermont. As a member of the Agroecology and Rural Livelihoods Group (ARLG) and the Insect Agroecology Lab, Victor has worked with a diversity of farmers looking to sustainably manage insect pests in the region. His research focuses upon insect pest invasions (e.g. SWD, Colorado potato beetle, etc.) and developing best practices for minimizing the impact of rapidly evolving populations. You can find out more about Vic and his work at his faculty website and associated ARLG website. Scott is an entomologist teaching at Saint Michael’s College and University of Vermont. He has been conducting applied agricultural research on farms throughout Vermont since he moved here in 2006. His research has focused mainly on biological control of agricultural pests through enhancing native natural enemy communities, and his areas of expertise include entomology, biological control, insect agroecology, and sustainable agriculture.